Gord Barney moved to Ladysmith on Vancouver Island at a very young age. His father George was a faller for MacMillan Bloedel, at Copper Canyon, and Nanaimo River camps for 31 years. Gord went to work in the woods at age 16, as did a lot of young men around Ladysmith at that time. The jobs were many and he chose the forest industry. He started work punking whistles and then worked on the riggin', moving upward until he was a machine operator. He logged up and down the West Coast of British Columbia, on the Queen Charlotte Islands and in many of the small logging camps on the Central Coast. He always drew cartoons as a young man and then put them to use, drawing caricatures of his logging buddies and made fun of some of the woods bosses. Throughout the years he also wrote down stories that he heard in the bunkhouse on scraps of paper and then later copied them on to a computer disk. His attempt at making a book, Timberbeasts of the Great Bear Rain Forest, was a great hit with all the loggers who have read it. Gord worked in the forest industry until he retired at age 55. He lives in Ladysmith, near his two sons, Clay and Martin. He has drawn many logging cartoons and submits written material regularly to the IWA Green Gold Newspaper. Gord Barney is one of a dying breed of man. 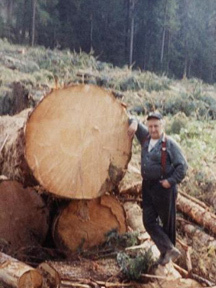 A big barrel-chested brute, Barney, suspenders and all, is a walking encyclopedia for the logging industry having served in nearly all facets the industry has to offer. Logging is in his blood, having grown up watching his father fall trees to keep the family fed. The self-taught grapple yarder operator has met a lot of different people and has collected a lot of different stories. Now retired, Barney resents the fact the industry he grew to love and cherish has changed from one of camaraderie and good times to corporate greed and bottom lines. In the spirit of capturing the glory days, Barney has just released a new book Haywire: From The Cook-shack to the Tail-blocks More Tales of a B.C. Logger. When he took all his material to his publisher, Tom Paterson, the amount of stories Barney had was enough to fill two books. Barney's cartoons and caricatures of bosses can likely still be found in some camps and mills up and down the coast. Barney's colorful yarns include tales like a close call with some local 'muscle' while playing pool in the Queen Charlottes. Barney fondly remembers his time as a tree faller - which he preferred to life in a sawmmill - hanging out with his co-workers and being outdoors. Barney's books are available at Salamander Books in Ladysmith, the Ladysmith and District Historical Society or through himself at 202-219 Dogwood Drive Ladysmith V9G 1S9. He is charging $25 for Camp Inspector and $22 for Haywire plus $4 postage or $40 for the both plus postage.